Seating five, the four-door sedan came in two versions, with two different engines. The 3.0 sedan used a 3.0-liter V6, derived from a Ford design. The S-Type 4.0 held a 4.0-liter Jaguar V8. Both engines drove a Ford/Jaguar five-speed automatic transmission. Lincoln's LS used its own versions of each engine. Traction control and antilock all-disc braking were standard, along with front head/chest side airbags. Options included a Weather Package with Jaguar's antiskid Dynamic Stability Control, and a Sport Package with computer-controlled shock absorbers and high-speed tires on 17-inch wheels. A Deluxe Communications Package included an in-dash navigation system/cell-phone assistance system, plus voice-activated control for the phone, audio, and climate functions. 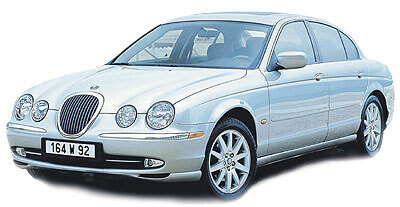 With its sensuous looks, Jaguar's S-Type makes a statement when it rolls onto the scene. It combines that with a luxurious, crafted interior in understated British fashion. The S-Type cars are effortless to drive with a relaxed, refined ride. They offer cutting-edge technology that's relevant and free of gadgetry.